It's time again for Secret Recipe Club reveal! My secret blog assignment this month was Lisa's blog Sweet as Sugar Cookies. As her blog title would suggest, Lisa is "all about the sweets" so there are plenty of yummy looking sweets to choose from. There are, of course, lots of cookies and an entire list of recipes just for chocolate chip cookies. 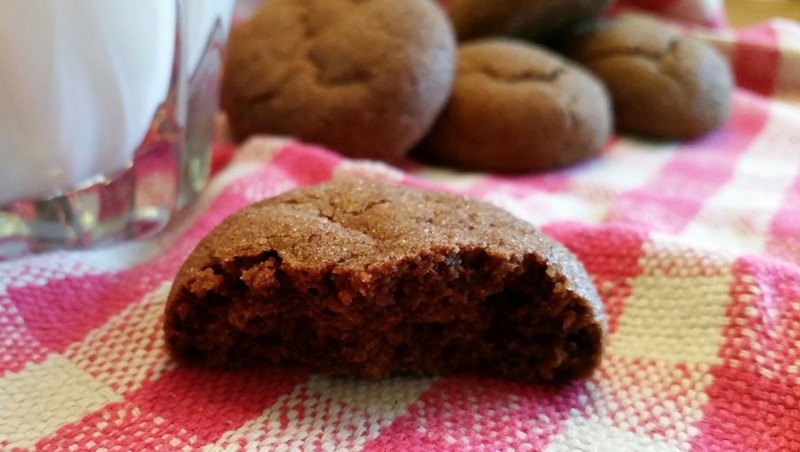 I figured it was only right that I make some kind of cookies from Lisa's blog, and when I saw these Mexican Chocolate Snickerdoodles I knew they were the ones. 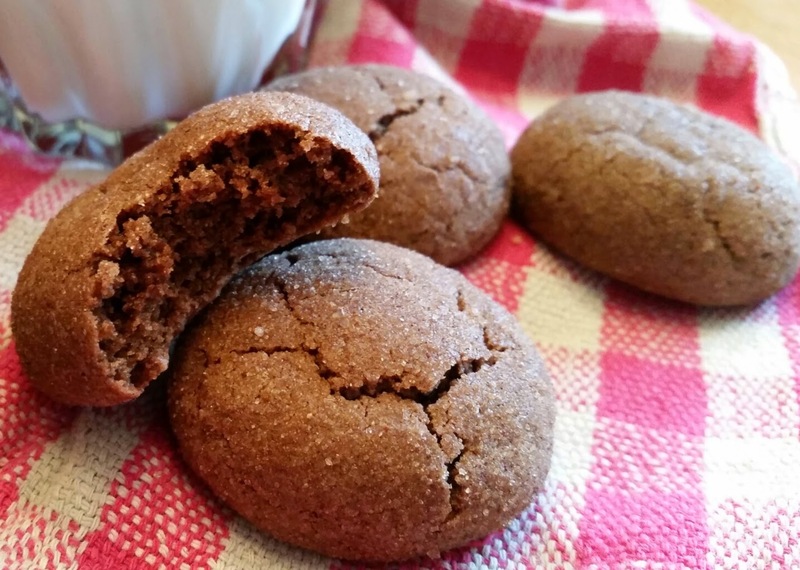 I've always loved Snickerdoodles - though I haven't made them in ages - and the addition of chocolate with a kick of cayenne made them sound absolutely irresistible. 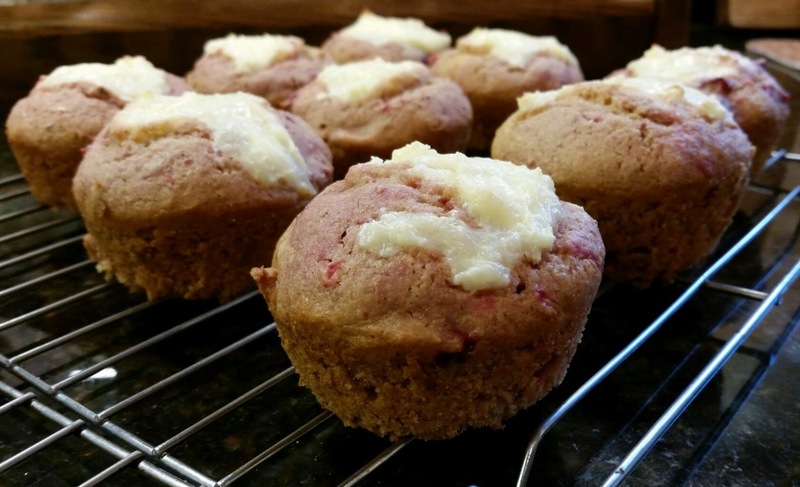 I did think about making these Strawberry Lemonade Muffins, but then I went right back to the cookies. I'll definitely be trying those muffins sometime, though! 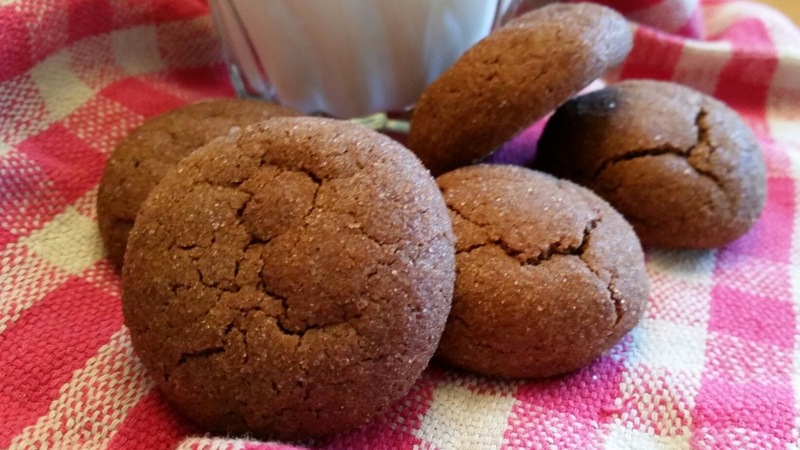 These cookies bake up slightly crunchy on the outside, soft and cake-like on the inside. 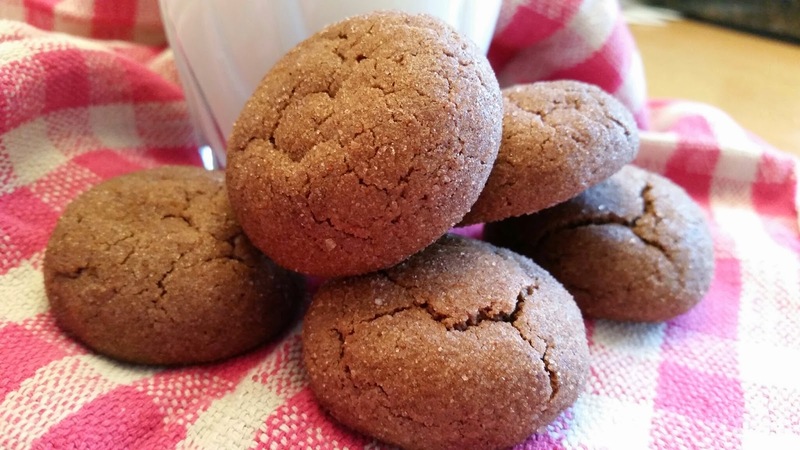 I especially love that little bite from the cayenne, especially in the cinnamon sugar mix on the outside. So good! My husband doesn't like a lot of spice in his food, but even he enjoyed them, so they're not super-spicy - just have that little kick to make them fun. Cream butter and sugars together. Add eggs and vanilla; mix well. Combine flour, cocoa, cream of tartar, baking soda, salt and cayenne. Mix in and stir until well combined. Chill dough for about an hour. Roll dough into 1" balls and roll in cinnamon/sugar mixture. Place on ungreased cookie sheet and bake 10-12 minutes at 350°, until cracked on top. Cool 2-3 minutes on cookie sheet before removing to wire rack to cool. 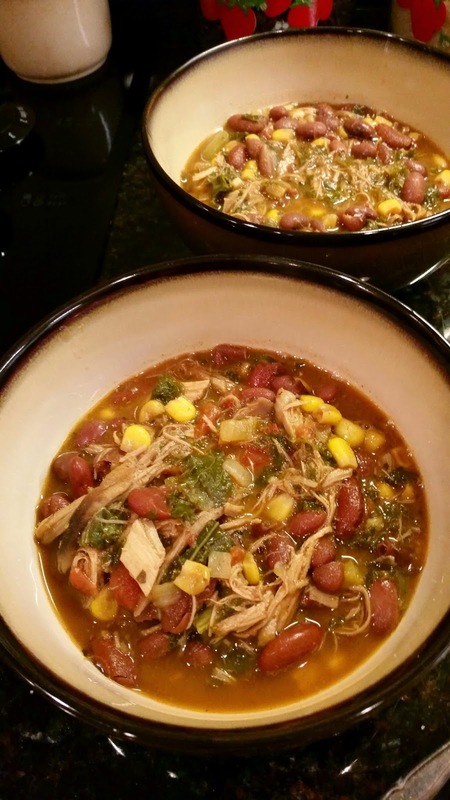 I love this cooler weather because it's the perfect weather for soup! And boots and sweatshirts, fires in the fireplace, and snuggling up under the covers at night. I mean, I would be OK if it wasn't quite so cold already in November, but I'm just going to enjoy it. And make soup. I made this one last week, and it's very tasty and satisfying. I love all the beans. I can't believe there was a time I didn't like beans. Now I adore them. The original recipe called for 2 cans of beans. I ended up using 4! I was really only planning to put 3 in, but I accidentally opened a can I didn't mean to open. The beans were on top of the diced tomatoes I meant to grab, but somehow I moved the beans to grab the tomatoes and then put the tomatoes back and kept the beans - and then I opened them without looking at the can. Oh well - lots of beans in this soup! In a large heavy-bottomed saucepan or Dutch oven, heat olive oil over medium-high heat. Add the onion and cook until translucent, about 4 to 5 minutes. Add the garlic and cook for 30 seconds then add and the bell pepper and season with the cumin, oregano, chili powder, and salt & pepper. Cook, stirring frequently, for about 4 to 5 minutes. Add the beans, kale, corn, turkey broth, and tomatoes. Bring the mixture to a boil and then turn the heat down low and simmer for about 20 to 30 minutes, or until some of the liquid has reduced. Add the shredded turkey and red pepper flakes (if using) and simmer for another 5 to 10 minutes. Season with more salt and pepper, to taste. Enjoy! 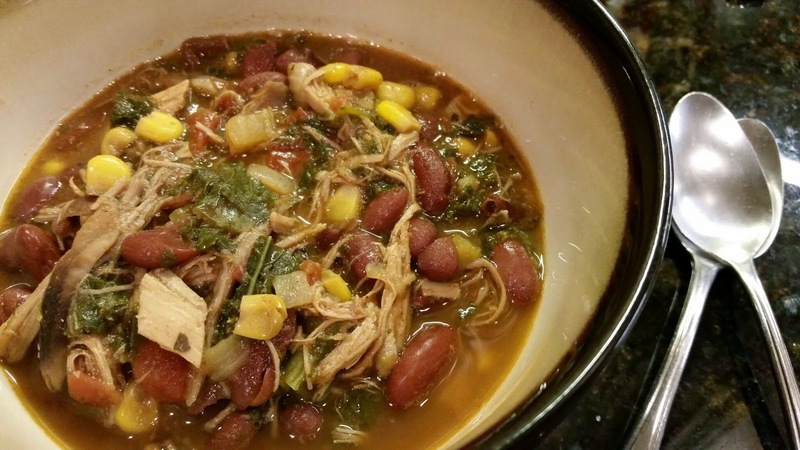 Like most soups, this is a great make ahead meal. Make it one day, cool and refrigerate, then reheat the next. 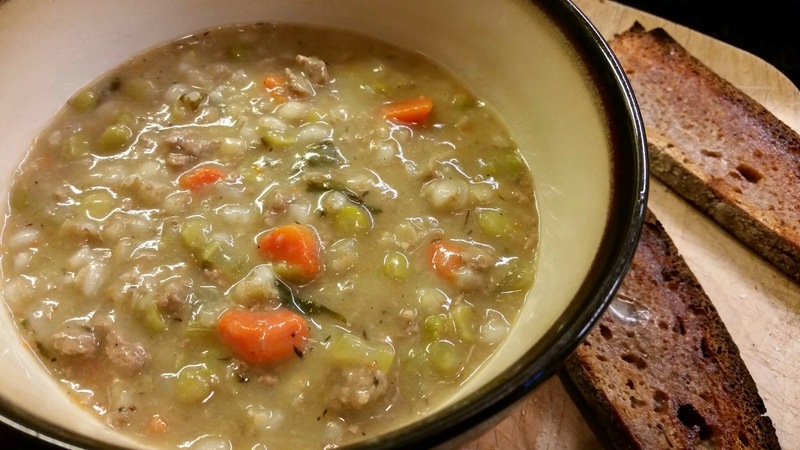 Soups just get better and better the more times you reheat them. I did end up adding a bit of water the second time I reheated this, because it thickened up a lot and there wasn't much broth left. The original recipe used white beans, chicken stock and rotisserie chicken, Swiss chard, and added some diced zucchini, but I had just pulled some red beans and kidney beans out of my freezer - to make just a regular old pot of chili, except I then realized I had no tomato sauce so I needed another recipe for the beans - so I used the red beans. I think any beans would work, whatever you like or have on hand. 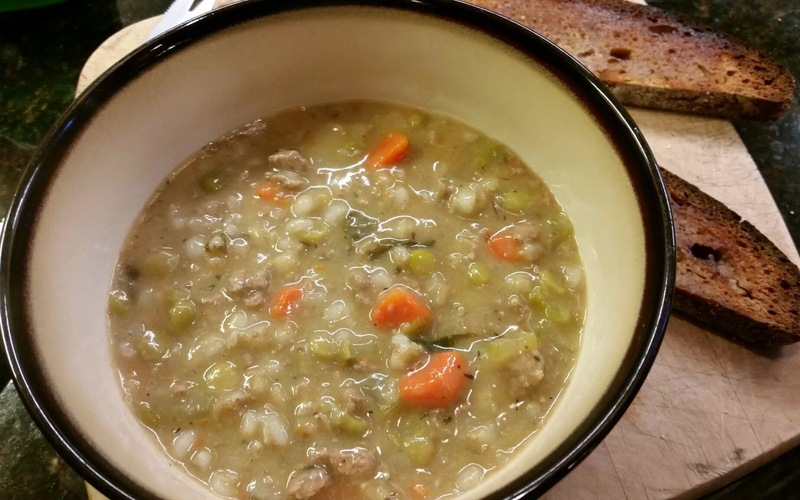 I used turkey and turkey broth because I had those in my freezer too, and with Thanksgiving coming up and turkeys on sale, I will soon be cooking another turkey and replacing some of that cooked turkey and broth. I'm cleaning out the old to make room for the new! Anyway, that's a long way to say - the seasonings are really good in this, but you can mix, match, and substitute the ingredients you have and the ingredients you like, and you're still going to come out with a very good soup perfect for a cool weather meal. Serve with a pan of cornbread fresh out of the oven, and you have perfection! Or something very near. I've made this a couple times for dinner. It really does go together quickly, and it tastes good too. The original recipe calls for 1 lb. of ground beef, but I like things better without so much meat, so I cut it in half. I do that with most of my recipes. If you're a big carnivore, feel free to use the whole pound. Brown meat in large nonstick skillet on medium-high heat; drain. Add seasoning mix, beans, corn, salsa and water; stir. Bring to boil; simmer on medium-low heat 5 minutes. Stir in tortilla strips; top with cheese. Remove from heat; cover and let stand 5 min. or until cheese is melted. Top with sour cream and onions. 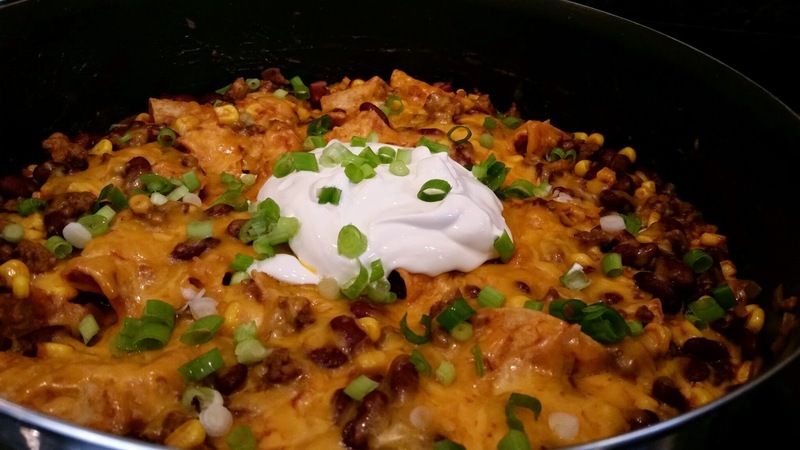 This recipe is very adaptable - add some chopped onion with the ground beef, use black beans or pinto beans, use flour tortillas or stir in some tortilla chips for some added crunch. Feel free to add your favorite toppings or sides - shredded lettuce, tomato, avocado, rice, etc. You can also serve the sour cream and green onion on the side and let everyone top their own servings the way they want. When I saw this recipe, I knew I had to try it. 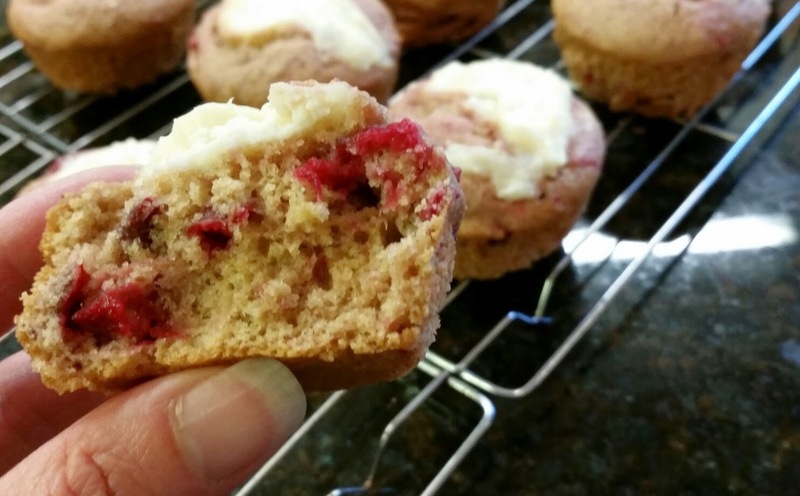 I love anything with cranberries (I previously made these amazing Lemon Cranberry Muffins from the same blog), and the addition of the cream cheese just sounded amazing. I've made these twice this week. The flavor is really amazing. It reminds me of this Almond Tart a bit - probably because of the almond extract and the cranberries. Those flavors just go together so well. The soft, slightly sweetened cream cheese is just a bonus. If you want, you can take a knife (or your finger) and spread that soft cream cheese all over your muffin. Yum! Preheat oven to 350°. Line muffin tin with paper liners or grease well. In small saucepan, combine another 2 T sugar with the cranberries. Heat on medium, stirring occasionally, until cranberries pop. Mash slightly with a wooden spoon and set aside. In mixing bowl, beat eggs then stir in the rest of the granulated sugar and the brown sugar. Mix in oil, vanilla, and almond extract. Stir flour, flax seed (if using), baking powder, and salt together; mix into wet ingredients. Then gently fold in cranberries, being careful not to over-mix or your batter will turn pink. Pour batter into prepared pan, filling muffin cups about 2/3 full. 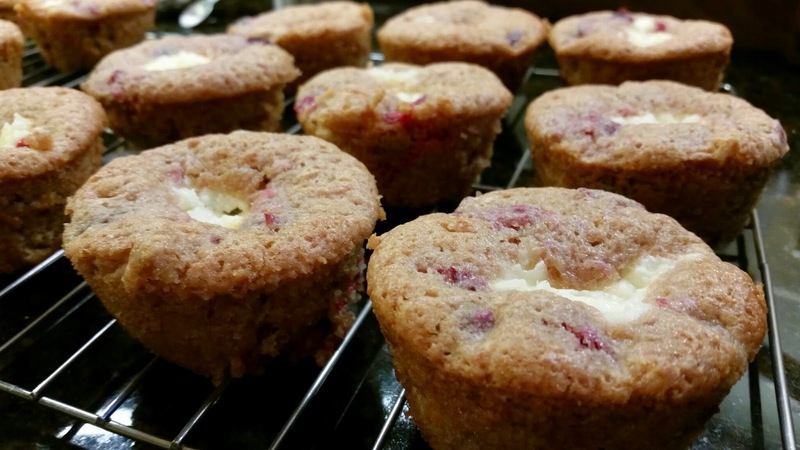 Use a spoon to scoop cream cheese mixture into the center of each muffin, pressing down gently. Bake 20-25 minutes, until golden brown. Cool 5 minutes in muffin tin then remove to wire rack to cool. I like my muffins dense and not too sweet, so I used the white wheat flour and flax seed and cut the sugar down just a touch. 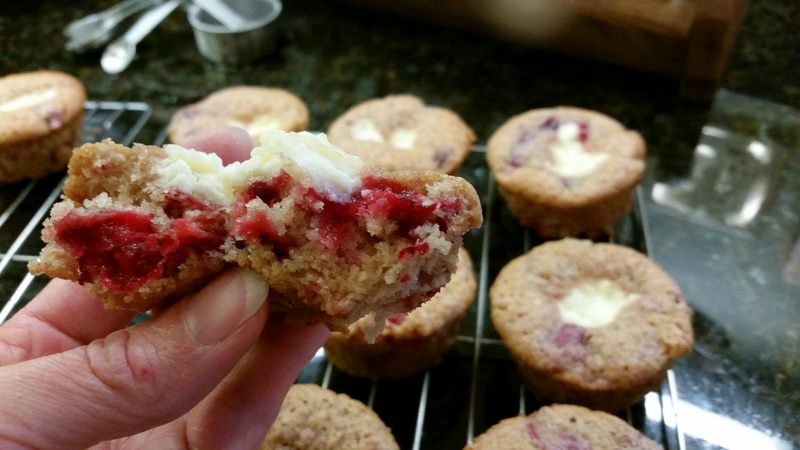 They were still plenty sweet, but if you like your muffins sweet and light, use 1 cup of sugar in the batter, with an additional 2 T sugar for both the cream cheese and the cranberries. And use white flour instead of the whole wheat, though white wheat isn't as heavy as regular whole wheat would be. I would also recommend using cupcake liners because, even with the wheat flour, these muffins wanted to stick to my muffin pan just a little. The reason I made these twice in one week wasn't just because I love the flavor - which I do - it was because the recipe, as first posted, called for about 1/2 the flour it should have. (Sarah weighed all her ingredients, so she got it right, but then she used an online conversion calculator when she wrote the recipe post) I did not even bother to check, just followed the recipe - and they still turned out really good! Just very delicate. And hard to stop eating. Very hard to stop eating. It's time again for Secret Recipe Club reveal! My secret blog assignment this month was Kitchen Trial and Error, a blog written by Kate. Along with her husband Jason - chief taste-tester and occasional guest poster - and two adorable sons, Kate lives in Rochester, NY. She never planned to become a blogger, but has found it's a great way to keep track of her recipes and all those kitchen trials and errors. I just started on the first page of her blog and started scrolling, and found so many amazing recipes. Then I decided to check out Kate's Recipe List, which she has organized by year starting with 2010. These are just a few of the recipes I want to try, and I haven't even made it through 2011. YET. They all look amazing. I can't stop! I love that she's got them organized this way, because the older recipes will still get attention instead of getting lost in the archives. However, I don't know if I'll ever make it up to the present day because there are so many I want to check out. I finally settled on this Spaghetti & Meatball Soup (Spaghetti Stoup) because it just looked so good, and it would go perfectly with my fresh-baked Sourdough Bread. I'm pretty sure this is only the beginning, though. I will be trying many of Kate's recipes! For meatballs: Use your hands to combine beef, egg, bread crumbs, and Parmesan. Set aside. Coat the bottom of a large Dutch oven with olive oil and heat on medium. Add the onion, carrots, garlic, and bay leaf and cook about 5 minutes, until vegetables start to soften. Stir in basil, salt, and pepper. Add chicken broth, tomatoes, and tomato sauce. Cover and bring to a boil. Roll meat mixture into small meatballs, about the size of a walnut. Once all meatballs have been formed, drop them into the simmering soup and simmer 10 minutes. Add spaghetti and cook 10 to 12 minutes or until the pasta is done and the meatballs are cooked through. 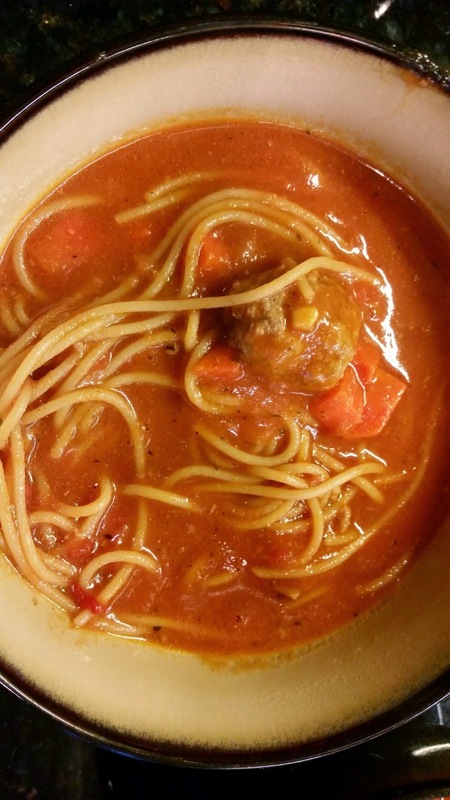 Mix the meatballs up ahead of time and store in the refrigerator. You can even form the meatballs and store them in a covered container. Just put waxed paper between the layers if you have more than one. Chop the onion, garlic, and carrots; store in covered container in refrigerator. While it will still take the same amount of time, doing some of the prep early in the day or even the night before (whenever you have time) means, when it's time to make dinner, you just have to throw things in the pan - and you'll have a delicious soup in no time! We really enjoyed this, and it was perfect with the sourdough bread. I wasn't completely sure about just dropping the meatballs into the soup without baking or browning them first, but they were just perfect. I will definitely make this again! The soup was much thicker when we enjoyed the leftovers - as most soups are. 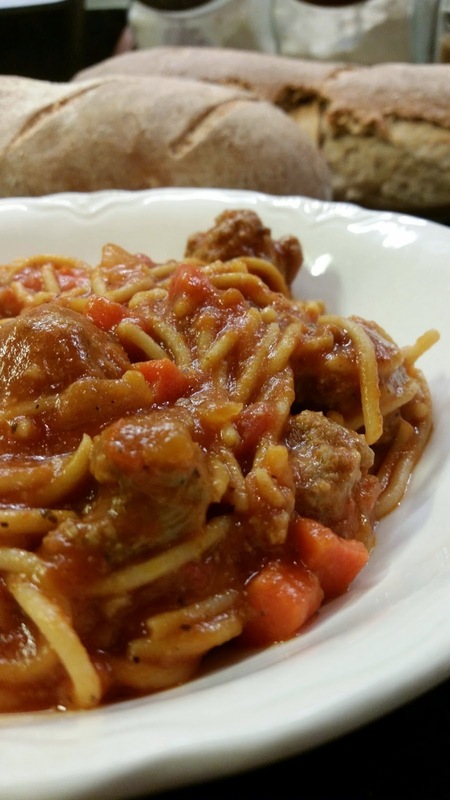 It was kind of like a really saucy pot of spaghetti, and just as tasty as the first time. I have a hard time believing that some people refuse to eat leftovers. Most things just get better and better each time they are heated up. I think this would make a great dish to take for a potluck, just put it into a crock pot or slow cooker to warm it up. My husband said that maybe I'd want to skip the carrots for that, but I really like the carrots in this. Maybe grating them instead of chopping would let them be in there but disappear a bit more - so people like him wouldn't even know they were there. But I would.